Bhagwan’s stand proved irresistible to many of the 8000 global visitors and personnel from the 300 exhibiting organisations at one of the busiest, most enjoyable events in years. Many were intrigued by a stunning 3D Hologram Presentation incorporated into the design, with finely detailed graphics that summarised the company’s range of services. High quality video footage of Bhagwan crews in action across a range of assignments and environments, to-scale vessel models and even bubbling stools all added to the effect of what was a truly interactive and dynamic exhibition stand. The Hologram Display in particular was a drawcard, and it gave Bhagwan representatives an opportunity to introduce the company to an audience of Oil & Gas professionals from around the world. 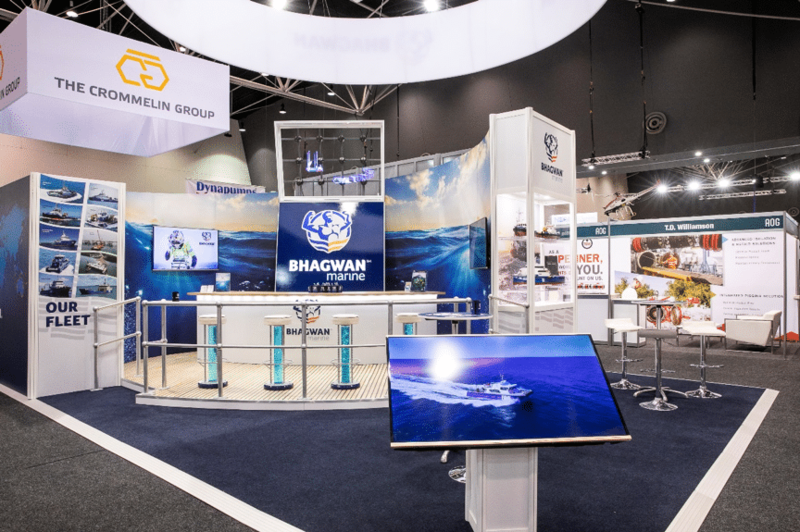 Bhagwan Marine – AOG 2019 (Stand & Hologram Video) from Matt Syms on Vimeo. Bhagwan Marine Managing Director Loui Kannikoski said that the win was a testament both to his Marketing team, and to the great strides the entire company had made in the last few years to become Australia’s premier and most diverse marine services company. Mr Kannikoski said he thoroughly enjoyed the show, and that it helps mark Australia as a worldwide industry leader.